Download The Parts of a Flower Powerpoint Presentation for a clear introduction to the parts of a flower. Have students bring flowers to class and dissect them. (If you are in a setting in which students may not have easy access to wildflowers or flowers in their own gardens, bring a bouquet of mixed flowers to class.) Use the American Museum of Natural History’s Flower Anatomy page if you don’t have a diagram in your science text. Have students recreate the diagram with the parts of their flowers. Create a class Pinterest board showing as many different kinds of flowers as possible. Challenge students to find the petals and stamens of each flower. 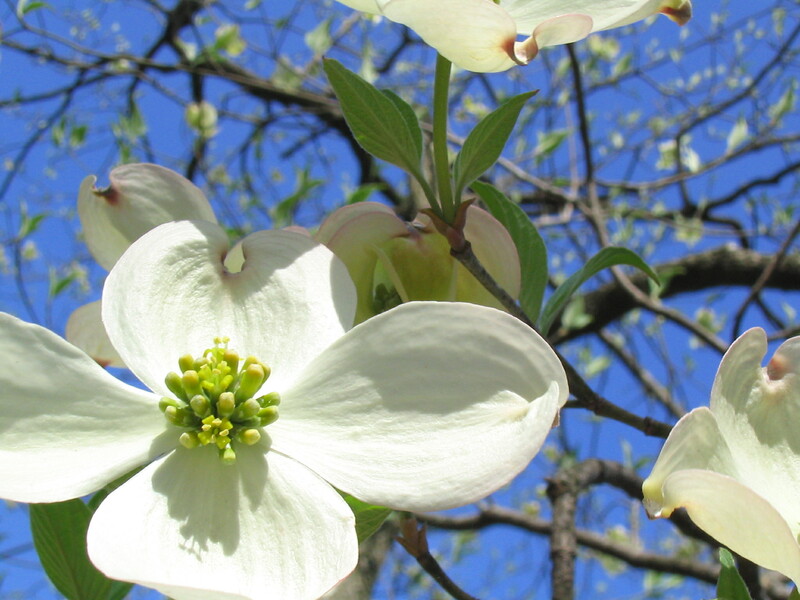 This can be tricky — for example, the large white flowers of the dogwood flower are actually bracts (like the poinsettia) and the petals are the tiny structures in the center. Probably the best possible way to study the life cycle of the plant is to plant one. In Tech Lessons on Plants you can simulate the life cycle in Google Earth, or you can find a bean growing project in Jack and the Beanstalk. Flowers grow in many different habitats. If you’re using the Pinterest board idea, you might want to add separate boards for flowers found in different habitats, such as mountains, deserts, tropical and temperate forests, prairies, and cities. However, these distinctions are often only relevant to wildflowers. Not only are flowers cultivated in plenty of habitats which are not their natural habitats, but they are also carefully bred to live in different habitats from their own. Gardens are sort of like zoos for plants; most gardens, whether at your school or your students’ homes or a large botanical garden, showcase plants from many different places. Find a native plant garden in your area and visit it. How many of the flowers there are familiar to your class? Use online research or field trips to identify ten plants that are native to your region. Plan a garden for your school using these plants. Maybe you can really plant the garden! Use coloring pages of the state flowers to create a paper quilt of the United States. Divide the coloring pages among students and ask each student to find out why the flower was chosen by the state. Traditionally, flowers had a variety of meanings, so that people could communicate in their secret language. If you sent your friend a bunch of Bells of Ireland, it meant, “Good luck!” Check out the Language of Flowers page from Texas A&M, and see how practical this kind of communication might be. Decide how the main characters of the literature you’re currently reading would have put together a bouquet that showed their true feelings. Flowers turn up in literature sometimes. Discuss the flowers in Sleeping Beauty as an example. Then find examples of flowers that are important in books you’re reading, popular songs, and movies the class has seen.